Learn more about the techniques and processes that I use to design and develop websites. 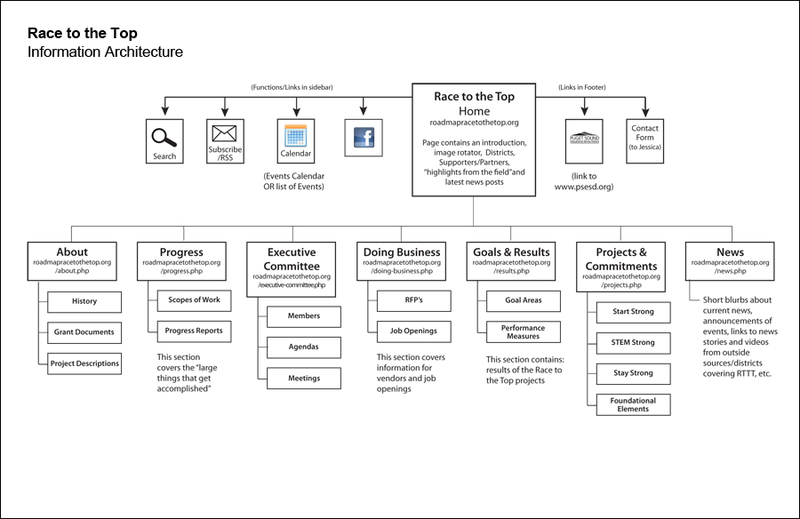 When creating the wireframes for this project, I focused on how the content would be laid out on the “Home”, “Executive Committee” and “News” pages. Winning the The Race to the Top grant was a fantastic experience for the Road Map District Consortium. However, since this was an unexpected ‘win’, a lot of work by many people had to occur over a short period of time to put the proposed plan into action. This website was created under a tight deadline — with only 1 1/2 months from the initial planning meeting to the actual site launch. I will be covering the design process for this website in my next few posts. The Information Architecture for the site went through several phases before the navigation was finalized. When the site launched, it was composed of a home page, seven main pages and several sub-pages. As time goes on, the site will grow with more information about the Road Map Race to the Top grant being added.